Spinal stenosis indicates a pathological condition causing the compression of the contents of the canal, especially neural structures. The term stenosis means a narrowing of the caliber of an orifice or a tube. Spinal stenosis, therefore, defines a narrowing of the bone channel occupied by the spinal nerves or the spinal cord. This is usually due to the common occurrence of spinal degeneration that occurs with aging. It can also sometimes be caused by spinal disc herniation, osteoporosis or a tumor. Presence of congenital anomaly or a deformity may contribute towards spinal stenosis. Some people are born with a congenital form, but most develop spinal stenosis as part of the degenerative changes over the period. A lot of people with spinal stenosis are not symptomatic initially. But as part of the aging process, most people will eventually notice radiating pain, weakness, and/or numbness secondary to the compression of the nerves or spinal cord. Spinal stenosis related to degeneration in the spine [most common cause] usually will become significant in the 5th decade of life. The subtle changes in spinal stenosis often result in a gradual decrease in physical activity, and a development of a more kyphotic or forward flexed posture. The lower back develops lumbar stenosis, while the neck develops cervical stenosis. Thoracic stenosis can also occur but is less common. It may be present in all three places in the same patient. Most persons older than 60 years have spinal stenosis. Certain people are more likely to develop degenerative spinal stenosis than others. A family history of spinal stenosis, chronic back problems, being heavy laborer or athlete increases the risk. The symptoms of spinal stenosis depend on where the stenosis occurs in the spinal canal and how severe it is. The spinal cord is contained in spinal canal which is formed by stacking of vertebrae one above other interspersed by a disc in between. Superior and inferior facets form facets joints. Thus two superior facets of the lower vertebra articulate with inferior facets of the higher vertebra. The essential content of the spinal canal includes the spinal cord, the cerebrospinal fluid (CSF) of the thecal sac, and the dural membranes that enclose the thecal sac. The spinal nerve roots exit from neural foramina. 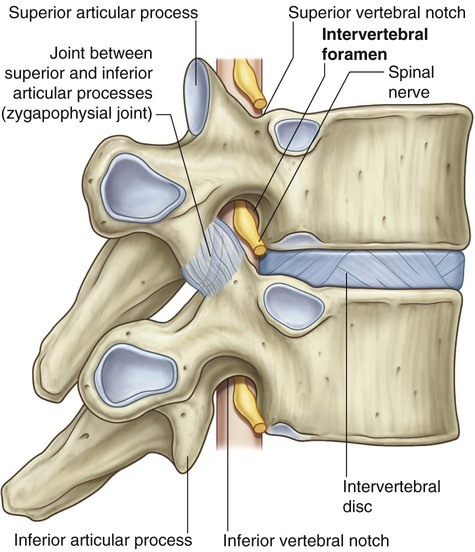 Specifically, the intervertebral foramen is bound by the superior notch of the adjacent vertebra, the inferior notch of the vertebra, the vertebral body, and facet joints on the transverse process of the vertebra. Mean normal adult male cervical canal diameter is 17-18 mm at C3-5 levels and 12-14 mm in the lower cervical spine. <10 mm of diameter is considered stenosis. Relative stenosis can be considered when dimensions are 10-13 mm in the upper cervical spine. Movements of the spine exacerbate congenital or acquired spinal stenosis. The diameter of the spinal canal in flexion and extension is reduced. During extension, the ligamentum flavum is folded, which further constricts the spinal canal. Moreover, the shortening of the spinal cord in extension is linked to an increase in diameter. If spinal stenosis is present, the spinal cord can be additionally damaged by movement. Anteriorly, the anterior roots are pinched between the annulus margins and osteophytes. Posteriorly, hypertrophic facet joints and thickened infolded ligamentum flavum compress the dorsal nerve roots. Congenital stenosis of the cervical spine may predispose to myelopathy as a result of minor trauma or spondylosis. Lateral cervical stenosis results from hypertrophy of the uncovertebral joints, lateral disc annulus bulging, and facet hypertrophy. The thoracic spinal canal varies from 12 to 14 mm in diameter in the adult. Primary central thoracic spinal stenosis is rare. Thoracic spinal stenosis is often associated with focal disease of a long-standing nature. Hypertrophy/ ossification of the posterior longitudinal ligament results in central canal stenosis. The diameter of the normal lumbar spinal canal varies from 15 to 27 mm. < less than 12 mm can be considered stenotic in some patients. A diameter of 10 mm is definitely stenotic. The diagnosis of type and location of stenosis becomes important for guiding the treatment. Subtle differences between central, foraminal, and far lateral locations need to be defined and treatment is planned accordingly. This occurs due to narrowing of the spinal canal defines midline sagittal spinal canal diameter narrowing and can cause pressure on the spinal cord or cauda equina or the individual nerves within the thecal sac. Disc abnormalities in normal canal disc bulges do not cause stenosis usually but in developmentally small canals, however, a prominent bulge or small herniation can cause symptomatic central stenosis. Claudication, hip pain etc are the main symptoms. It is also called by many other names like lateral gutter stenosis, subarticular stenosis, subpedicular stenosis, and intervertebral foramen stenosis. It is defined as narrowing ( space< 3-4 mm) between the facet superior articulating process and the posterior vertebral margin. Radicular pain is caused due to impingement of nerve. Such narrowing may impinge the nerve root and subsequently elicit radicular pain. The lateral region is divided into different zones. Depending upon the location the stenosis is termed accordingly. The entrance zone lies medial to the pedicle and superior articular process. Superior articular process hypertrophy of facet joint. Herniated nucleus pulposus anterior to the nerve root. The mid-zone extends from the medial to the lateral pedicle edge. Bursal or fibrocartilaginous hypertrophy at a spondylolytic defect. It involves an area surrounding the foramen and can cause impingement of the exiting spinal nerve. This stenosis occurs lateral to the exit zone. This kind of compression occurs with far lateral vertebral body endplate osteophytosis and when the sacral ala and L5 transverse process impinge on the L5 spinal nerve. There is often a combination of foraminal and far lateral stenosis. Spinal stenosis results from progressive narrowing of the central spinal canal and the lateral recesses. Symptoms of spinal stenosis result from cord dysfunction caused by a combination of mechanical compression and degenerative instability. In the cervical spine, intervertebral disc degenerates and collapses with age. C5-6 and C6-7 are the most common levels of this occurrence and there occurs a relative decrease in spinal motion at these levels. A compensatory increase in spinal motion occurs at the levels C3-4 and C4-5. Bone growth (osteophytes) is a stress response of spine which can develop anteriorly or posteriorly at the superior and inferior margins of the vertebra. Posterior osteophytes cause narrowing of the spinal canal diameter. Arthritic degeneration [ synovial cysts] and hypertrophy of the facet joints can further compromise the canal and foraminal space. Abnormal motion lead to instability with listhesis (subluxation of vertebral bodies out of the normal cervical alignment). Thus the cord becomes compressed from spur formation at C5-6 and C6-7 and compressed from listhesis at C3-4 and C4-5. Ligamentum flavum hypertrophy further contributes. The cord is subject to further injury from repetitive dynamic injury during normal neck movements. Disc desiccation and degenerative disk disease with resulting loss of disc height may induce segmental instability. This causes vertebral body and facet joint hypertrophy. Inferior articular process hypertrophy of cephalad vertebral promotes central spinal canal stenosis This can be further worsened by herniated nucleus pulposus, ligamentum flavum hypertrophy, and disk space narrowing. Superior articulating process hypertrophy of caudal vertebra contributes to lateral recess and foraminal stenosis. L3-L4, L4-L5 are most commonly affected by degenerative stenosis. For foraminal stenosis, degenerative disc disease and disc desiccation are the initial events leading to decreased disc height. This allows the superior articular process of caudad vertebra to sublux anterosuperiorly and decreasing the foraminal space. Biomechanical disruption due to continued subluxation leads to osteophytosis and ligamentum flavum hypertrophy. These further compromise foraminal space. The stenosis can be anteroposterior (transverse) that is due to decreased disc height and hypertrophy anterior to the facet; specifically. The nerve gets trapped between the superior articular process and the posterior vertebral body. In vertical (craniocaudal) stenosis, posterolateral vertebral endplate osteophytes and a lateral herniated nucleus pulposus may impinge the spinal nerve against the superior pedicle. Sometimes the stenosis in foramina is dynamic. It implies intermittent lumbar extension-provoked nerve root impingement from herniated nucleus pulposus. Adult degenerative scoliosis, secondary to degenerative disc disease induced instability promotes facet hypertrophy and subluxation in the curve concavity. Degenerative spondylolisthesis, when combined with facet hypertrophy, causes central canal and lateral recess stenosis. Spinal stenosis can be caused by primary cause and secondary causes. Primary stenosis accounts for, occurring in only 9% of cases. Spinal stenosis associated with degenerative arthritis is usually seen in patients over 50 years of age. Certain people are more likely to develop degenerative spinal stenosis than others. People that have a family history of spinal stenosis, chronic back problems, who are heavy laborers or athletes are at increased risk. The primary clinical manifestation of spinal stenosis is chronic pain. In patients with severe stenosis, neural symptoms may also be present. Spinal stenosis of cervical and thoracic are more likely to directly affect the spinal cord [narrow spinal canal predisposes to traumatic injury] and myelopathic changes. In the lumbar spine, roots are more likely to be affected [the cord ends at L1] with stenosis mostly causing midline back pain and radiculopathy. It must be emphasized that the spinal canal size is not always predictive of clinical symptoms. Presence of disease like metastases and infection and would present with symptoms of the disease as well as the finding of stenosis. Regional pain is most common presentation along with changes suggestive of cord compression. The symptoms would depend on the region involved in stenosis and structures under stress. Males older than 55 years most commonly are affected. Loss of control of the bowel and/or bladder may occur at later stages. With progression, spastic quadriparesis results. Some patients also have associated ataxia from compression of spinocerebellar tracts. If associated cervical root impingement exists, patients may experience sharp radicular pain into the affected arm, with associated paresthesias and weakness referable to the compressed root. The reflexes in the affected root would be diminished or absent. There is increased risk of injury in case of minor cervical trauma. Other kinds of stenosis may cause radiculopathy i.e. pain, numbness, tingling, or weakness along the path of the nerve being compressed. In thoracic spine would mainly present with weakness of lower limbs only. Bladder/bowel control may be lost in severe stages. f the stenosis is severe enough, or if it is positioned centrally in the spine, patients may present with signs and symptoms of myelopathy (spinal cord dysfunction). Upon examination, these patients have hyperreflexia, positive Hoffman sign, positive Babinski sign, and/or clonus. The patients with radiculopathy may have decreased reflexes on the affected nerve root. The patient may be a normal examination, especially in dynamic stenosis. In the lumbar spine, the symptoms caused by compression of the nerves are of radiculopathy. These can include pain, numbness, tingling, or weakness or cramping in the legs and feet, particularly progressively with walking and being relieved with resting. Combinations of symptoms are often present. The chief complaint is severe lower extremity pain. The pain is decreased or absent when the patient is in a flexed position. Pain, Weakness, numbness in the legs occurs while walking. This is called neurogenic claudication and is a hallmark of spinal stenosis presentation. Bilateral neurogenic claudication is the classical presentation of this condition though foraminal or lateral recess stenosis can cause unilateral symptoms. Claudication occurs due to increased metabolic demands of compressed nerve roots that undergo ischemia. Pain is relieved when the patient flexes the spine [leaning forward, stooping, sitting]. Flexion increases canal size by stretching the protruding ligamentum flavum, reduction of the overriding laminae and facets, and enlargement of the foramina. This relieves the pressure on the exiting nerve roots. Symptoms of neurogenic claudication are exacerbated by standing erect, walking downhill etc. The symptoms get better by lying supine, sitting, squatting, and lumbar flexion. Neurogenic claudication needs to be differentiated from vascular claudication. Vascular claudication gets worse with biking, uphill ambulation etc and is alleviated with standing. Vascular claudication is a manifestation of the peripheral vascular disease. Patients of lumbar spinal stenosis compensate for symptoms by flexing forward, slowing their gait, leaning onto objects (eg, over a shopping cart) and limiting distance of ambulation. Patients with lumbar spinal stenosis may have wide-based gait, abnormal Romberg test, thigh pain after some seconds of lumbar extension, and neuromuscular abnormalities. Pain alleviation occurs with stationary biking and lumbar flexion. Let the patient walk with an exaggerated lumbar lordosis until NC symptoms appear or are worsened. The patient is then told to lean forward. Reduction of symptoms is suggestive of neurogenic claudication. Do look for signs of vascular involvement. The findings include absent pulses, changes in skin color [pallor] and signs of gangrene. Imaging helps to localize the site and level of disease and guides regarding the treatment. Radiographs are often the initial means of evaluating back pain. AP and lateral views can assess for degenerative changes including of disc height loss, vacuum phenomenon, osteophytes, and vertebral alignment. Unrelated causes of back pain, such as sacroiliac joint pathology, renal stones, or calcified aneurysmal dilatation of the aorta may also be identified. X-rays often limited evaluation of soft tissue and disc and identify malignancies and infection late. It is the best modality to know bony anatomy for surgical planning. CT is able to diagnose disc herniation and spinal stenosis by gauging canal diameter. It is more sensitive in the detection of metastases and infection. However, CT is unable to detect nerve-root impingement. CT myelogram can serve as an alternative to patients who cannot undergo MRI test. It is useful in diagnosing CSF leak and nerve root avulsion. Tumors or infections are better delineated by contrast-enhanced MRIs. These are not routinely done. These may be needed to rule or confirm some neurological diagnoses. Nerve conduction studies can help to find or rule out other confounding neuropathic conditions like neuropathies. Needle electromyography can help to diagnose lumbosacral radiculopathy with axonal loss. The treatment aims toward symptomatic relief and prevention of neurologic sequelae. This includes both conservative and surgical measures. Mild to moderate symptoms can be managed with conservative [non-operative treatment]. The treatment options include drugs physical therapy, medications, exercises, and spinal interventions like epidural steroid injections. Acupuncture has also been shown significant short-term benefits in lumbar stenosis syndrome with regard to pain and quality of life. Following classes of drugs can be chosen, individualizing for each patient. Activities that worsen the spinal stenosis symptoms should be avoided. For example, in lumbar stenosis, patients are encouraged to flex the spine little to get relief. This might include walking while bent over and leaning on a walker, stationary biking with leaning forward on the handlebars instead of walking for exercise and sitting in a recliner instead of on a straight-back chair. It is important for patients to remain active as tolerated and not become additionally debilitated from inactivity. This starts with a supervised physical therapy program. After a period, most people can then transition to their own exercise program. It is important to start mildly, progress slowly and build strength and tolerance over time. Lumbar extension exercises should be avoided as a spinal extension and increased lumbar lordosis are known to worsen. These exercises incorporate knee-to-chest maneuvers, pelvic tilts, wall-standing lumbar flexion, and avoidance of lumbar extension. For walking assistance, a roller walker can be considered. It provides some stability and promotes a flexed posture, which allows the afflicted patient to ambulate greater distances. Steroids inhibit edema formation from a microvascular injury sustained by mechanically compressed nerve roots. Infection, pregnancy [risk of teratogenicity due to fluoroscopic exposure], bleeding disorders and anticoagulation therapy are contraindications. Recent studies have challenged the benefits of epidural steroid injections. Surgery for spinal stenosis is indicated for significant myelopathy, radiculopathy, and/or neurogenic claudication. The approach for surgery depends on the spinal region and the anatomic nature of the compressive elements. depending on the surgery, concomitant stabilization may or may not be used. For example for limited laminectomy, the fusion may not be necessary whereas same may be added in case of multiple level laminectomy More often than not, fusion is not necessary after decompressive lumbar laminectomy. Fusion may be used in case of patients with stenosis and spinal instability. The gold standard of surgery to treat spinal stenosis is a laminectomy. Foraminotomy is added for foraminal stenosis. This includes removal of laminae, soft tissues such as hypertrophic ligamentum flavum are peeled off the thecal sac and out the neuroforamen. Laminectomy can be done in the lumbar or cervical area. In the cervical spine, anterior decompression of the spine via anterior cervical discectomy/corpectomy with fusion can be done if the compression is anterior there is kyphosis of cervical spine. Laminoplasty is another surgery that can be done for cervical stenosis and cervical myelopathy. The patient is discharged 2-5 days following surgery. The patient is encouraged to resume basic mobility, activities of daily living, and ambulation as soon as possible. Spinal stenosis can result in significant morbidity. Cervical stenosis can lead to severe disability. A slow progression appears to occur in all affected individuals. Patients with good preoperative function, short duration of symptoms, narrow dural sac area, spondylolisthesis, and absence of analgesics consumption are to be most likely to achieve a good outcome after decompression for spinal stenosis. Longstanding pain and loss of function may be difficult to treat. Kasai Y, Akeda K, Uchida A. Physical characteristics of patients with developmental cervical spinal canal stenosis. Eur Spine J. 2007 Jul. 16(7):901-3. Jenis LG, An HS. Spine update. Lumbar foraminal stenosis. Spine (Phila Pa 1976). 2000 Feb 1. 25(3):389-94. Malmivaara A, Slätis P, Heliövaara M, et al. Surgical or nonoperative treatment for lumbar spinal stenosis? A randomized controlled trial. Spine (Phila Pa 1976). 2007 Jan 1. 32(1):1-8. Machado GC, Ferreira PH, Yoo RI, et al. Surgical options for lumbar spinal stenosis. Cochrane Database Syst Rev. 2016 Nov 1. 11:CD012421. Forsth P, Olafsson G, Carlsson T, et al. A Randomized, Controlled Trial of Fusion Surgery for Lumbar Spinal Stenosis. N Engl J Med. 2016 Apr 14. 374 (15):1413-23. Slätis P, Malmivaara A, Heliövaara M, Sainio P, Herno A, Kankare J, et al. Long-term results of surgery for lumbar spinal stenosis: a randomised controlled trial. Eur Spine J. 2011 Jul. 20(7):1174-81. Johnsson KE, Rosén I, Udén A. Neurophysiologic investigation of patients with spinal stenosis. Spine (Phila Pa 1976). 1987 Jun. 12(5):483-7. Lohman CM, Tallroth K, Kettunen JA, Lindgren KA. Comparison of radiologic signs and clinical symptoms of spinal stenosis. Spine (Phila Pa 1976). 2006 Jul 15. 31(16):1834-40. Naderi S, Benzel EC, Baldwin NG. Cervical spondylotic myelopathy: surgical decision making. Neurosurg Focus. 1996 Dec 15. 1(6):e1. Sakamaki T, Sairyo K, Sakai T, Tamura T, Okada Y, Mikami H. Measurements of ligamentum flavum thickening at lumbar spine using MRI. Arch Orthop Trauma Surg. 2009 Oct. 129(10):1415-9. Alvin MD, Alentado VJ, Lubelski D, Benzel EC, Mroz TE. Cervical spine surgery for tandem spinal stenosis: the impact on low back pain. Clin Neurol Neurosurg. 2018 Mar. 166:50-3. Minetama M, Kawakami M, Nakagawa M, et al. A comparative study of 2-year follow-up outcomes in lumbar spinal stenosis patients treated with physical therapy alone and those with surgical intervention after less successful physical therapy. J Orthop Sci. 2018 Jan 29.